★Enjoy your outdoor life with this good helper. ★Grow healthier plants by preventing over or under watering. ★Perfect as a plant waterer and amazing for vacation plant watering. ★Suit for varieties of potted plants, houseplants, patio plants, hanging plants and outdoor gardens. ★Do not have to worried about your lovely plants, let the plant's partner free your mind. Just have fun! ★Before these watering globes been plug in the soil, please dig an appropriate hole to ensure the watering globes will safety and steadily on the place during daily use. 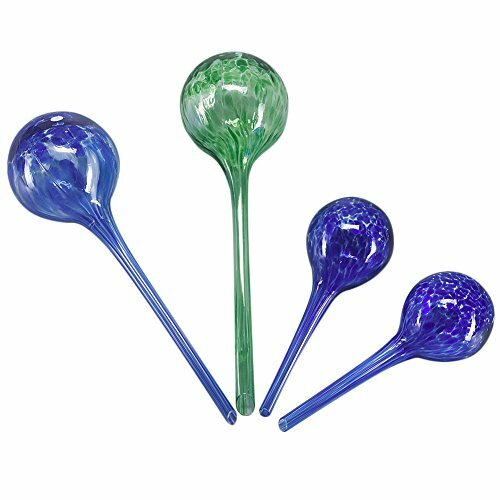 ★Please note: These globe are hand-make, and glass product is brittle. please be careful during using. Size: 7cm * 20cm (2.7" * 7.9") and 8.5cm * 30cm (3.4" * 11.9"). Grow healthier plants by preventing over or under watering. Easy to use vacation watering for outdoor and indoor plants. Just the right amount of water a plant needs. Recycle wine bottles to make a water. Suit for varieties of potted plants, houseplants, patio plants, hanging plants and outdoor gardens. If you have any questions about this product by Huvai, contact us by completing and submitting the form below. If you are looking for a specif part number, please include it with your message.